Russell & Kitty here. 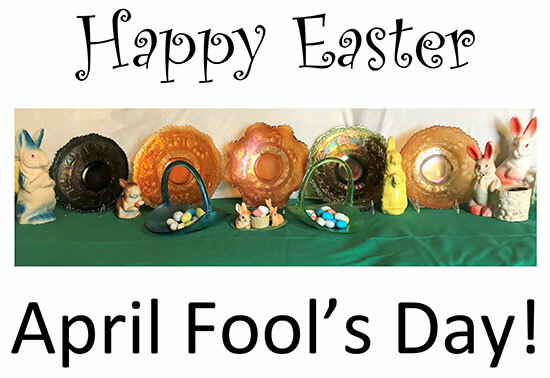 Can you believe that we are only a couple of days from Easter as well as April Fool’s Day so will April 1 be an April Fool’s Day and/or a happy Easter for you? Which event will you enjoy? Since this is Stretch Tuesday, we do have in the opening photo two Dugan Stretch Baskets that are filled with eggs that our rabbits left. Did scrub the green off the eggs so that they are more presentable. We have a love affair with the Peter Rabbit plates and bowls in carnival glass and haven’t yet found one even with a hint of a stretch finish, but we are still looking. We had a Dutch Belted black and white rabbit for years when we were first married. He got along great with our dogs and goat. So every time we see a Peter Rabbit bowl or plate, we think about “Jr”. Years ago, we had a wonderful discussion with Diane Fry about the Peter Rabbit pattern and why did they only make bowls (ruffled and ice cream shape) and plates in the pattern? Plus why do they only come in marigold, green and blue? Asked Frank Fenton those questions, he said he would get back to us with the answers. The answer to both questions came back as “I (Frank Fenton) don’t know”. Does anyone else know the answers? 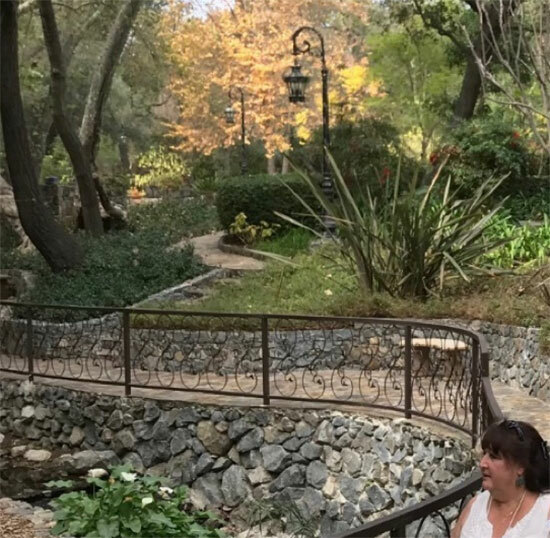 Again years ago, here in the Bay Area all of the collectors from all over the West would go to the Hillsborough Antique Show. Lots of very expensive glass, china, furniture, etc. would be offered for sale. It was a show that collectors would take days off from work to attend. 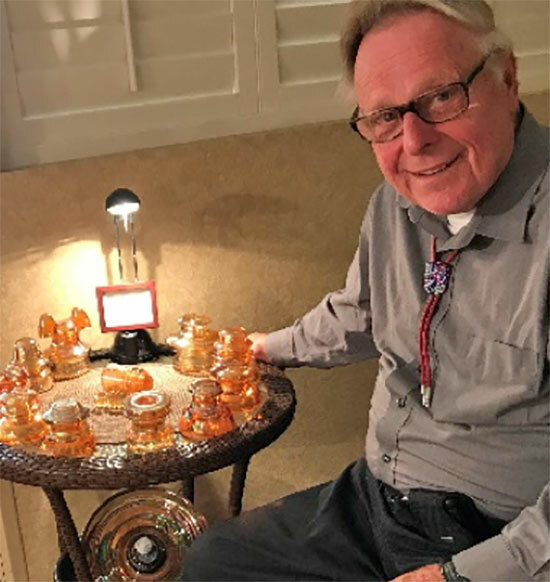 Don and Connie Moore, Sherman Hand, and all of the big carnival glass collectors would be at the door when it opened. We had to go after work. So as we were arriving, Don and everyone else would be leaving. One time, Russell spotted a Peter Rabbit marigold bowl under a table. The tag said $75; the dealer was FIRM on the price. Was it new? Couldn’t find any damage. No cell phone to call Don and he wasn’t home. So we took a leap of faith and purchased it. The next morning we called Don. He didn’t think it had been reproduced but would check into it. Needless to say, we never found another good piece of carnival glass while Don was alive at the Hillsborough Show! 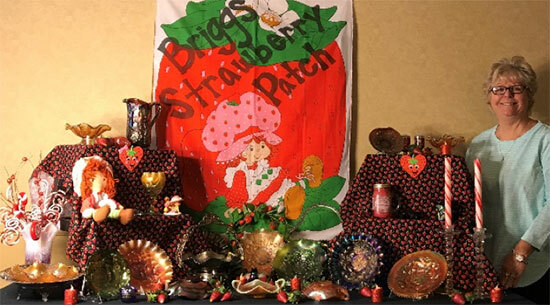 We have just returned from a wonderful warm and sunny Southern California Carnival Glass Club Convention. Everyone in the club works very hard to make it enjoyable for all. The programs were most informative. 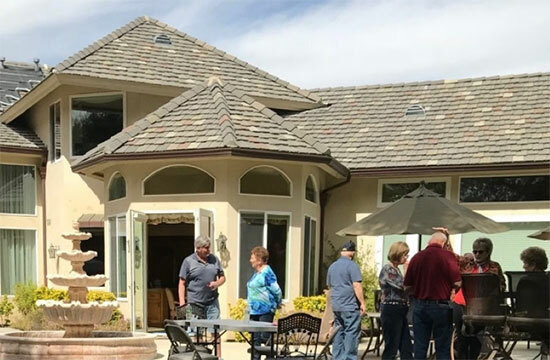 The open house this year included a Blue Grass Band and a rib luncheon/dinner in a heavenly setting. 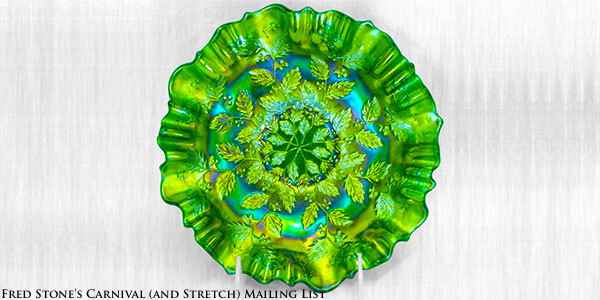 Jan and Jim Seeck had a carnival glass collection with outstanding color for us. Below are just a few of the room displays. It was a terrific convention. Mark it on your calendar for next year. The food in the hospitality room (mostly homemade) was delicious. 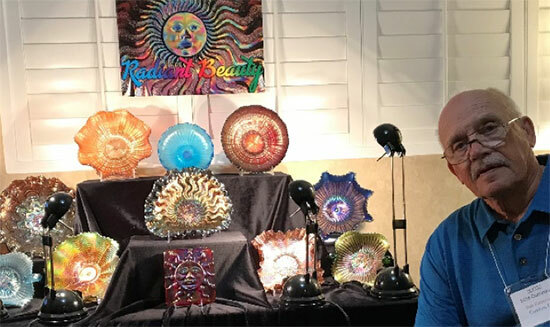 Gary (aka Road warrior) not only puts up beautiful displays, but brings wonderful glass for us to add to our collections. 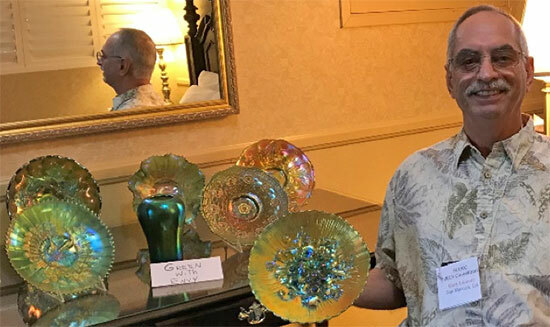 Gary thank you so very much for your devotion to promoting carnival glass. The outstanding Blue Grass Band that entertained us at the Open House. If you have never been or it has been a long time since you have come to a carnival or stretch glass convention, give it a try in 2018. 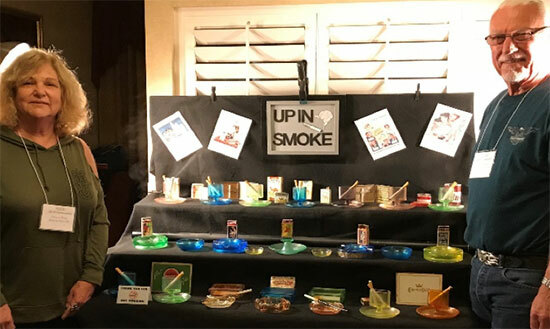 Even if you are shy, it is easy to put together a small display of carnival and/or stretch glass. 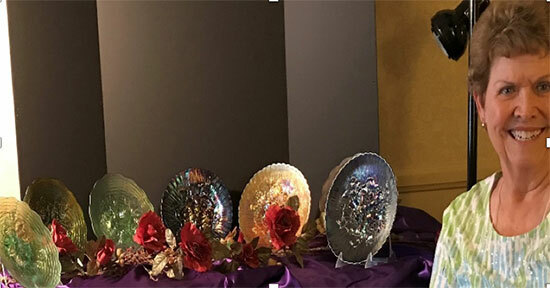 Just put together several of your favorite pieces of carnival and/or stretch glass; it doesn’t have to be fancy. Open your door at the convention hotel and people will come in to see your glass and you. It is very easy. If you are bored or shy, just go into the hospitality room and enjoy the food, sit down and start talking. It is so easy and you’ll meet the most wonderful people that love talking about carnival and/or stretch glass. You’ll find you will have lifelong friends.